Hammock chairs with a stand are easy to place anywhere you need a comfortable seat. They come in a variety of sizes and styles, ranging from a simple sling for one person to large hammocks suitable for two adults or several children. Not only are they versatile, but they offer an amazing array of styles and colors that can be incorporated into your home, patio or lawn décor. They can become your favorite relaxation retreat, or they can be used as extra or emergency seating for large parties or unexpected guests. Many of them require only a simple C-stand, which can be set up in minutes and does not need any added construction for your home or patio. They can be incorporated into play sets or even added to old swing sets that the children have outgrown. If you have a large, sturdy tree some of them can be hung from a tree limb. If you love the comfort of a hammock but have no place to put one, a C-stand with a colorful hammock chair could be the perfect solution. Soft cotton cushions with a back support provide a pleasant place to read, sew or just relax. The C-stand allows you to place it anywhere you wish, indoors or out. Easy to assemble having only four pieces, the steel frame is powder coated for extra wear resistance. Weight capacity up to 265 pounds. Purchase is backed by a one-year manufacturer’s warranty. If you love those summer breezes but hate to feel the perspiration trickling down your spine because your chair is just too cozy, you will love this hammock chair. Attached to a sturdy dowel rod that’s ornamented with tassels on each end, this seat is ready to hang just about anywhere. It can be attached to a C-stand, the kid’s swing set, a tree limb or suspended from the porch roof, or even from your living room ceiling. Hardware for hanging is included, but C-stand must be purchased separately. Like birds in the trees, you can nest together in this conical hammock. It will accommodate two adults or a bunch of kids. Strongly resembling the pendulous nests of weaver birds, these hammocks are the perfect place for a quiet chat, or to escape from curious eyes while enjoying the outdoors. Plan for some extra hanging height, however, as they require a minimum of eight feet of vertical space. Can be hung using a tripod frame. Enjoy comfort and understated good taste with this striped hammock chair. The attractive blue, gray, tan and white stripes are a soothing color combination. You can easily imagine them next to a bed of delphiniums, or even a bright bed of tulips. The cotton fabric is a good summertime choice. The hammock chair can be hung from any sturdy location, including on a C-stand, although a stand is not included. The weight capacity is 250 pounds and there is one-year warranty. Enjoy the last days of summer sun in a hanging hammock chair that resembles a big pumpkin. The sturdy curved ribs cradle a comfy cushion worthy of Peter Pumpkin’s reluctant bride. It comes in thirsty, pumpkin patch orange, beautiful candy apple red or understated leaf brown. In any color, it features comfort. Capacity is 400 pounds, so you and your sweety or you and a couple of kids can easily snuggle up in it. It is made to seat two adults. Nestle in this cozy egg chair and enjoy the summer breezes. It comes with its own C-Stand and can be placed indoors or out. The mesh sides both support and allow air to circulate, while the seat and back pad add comfort for the user. Bring your book, your handwork or just you to enjoy fresh air and sun. It also works well in a minimalist home décor where space is at a premium. It goes well with wickerwork, seascape designs, shabby chic, or country. While it strongly resembles the egg chair, this one’s bottom is lined with a round cushion strongly resembling those used in bowl chairs. It comes with its own C-Stand and has a weight capacity of 265 pounds. The circle base of the C-stand makes it a little friendlier toward floors than the three-legged stands. Capacity is one, and the gray color combined with the woven shell gives it an almost futuristic feel. The subdued color also makes it easy to mix and match with other furnishings. If curling up is your favorite way to sit in a chair, this aluminum framed swing chair will be just the spot for you. The woven body of the chair is olefin, a synthetic that will keep its color and shape through many seasons. The cushions are removable, so it is easy to keep them looking fresh and pretty. It is suitable for indoor or outdoor use, but it is recommended that for outdoors the cushions be removed and the chair covered when no one is sitting in it. The cheerful color of the woven body makes it a pleasant addition to any sunroom or patio. 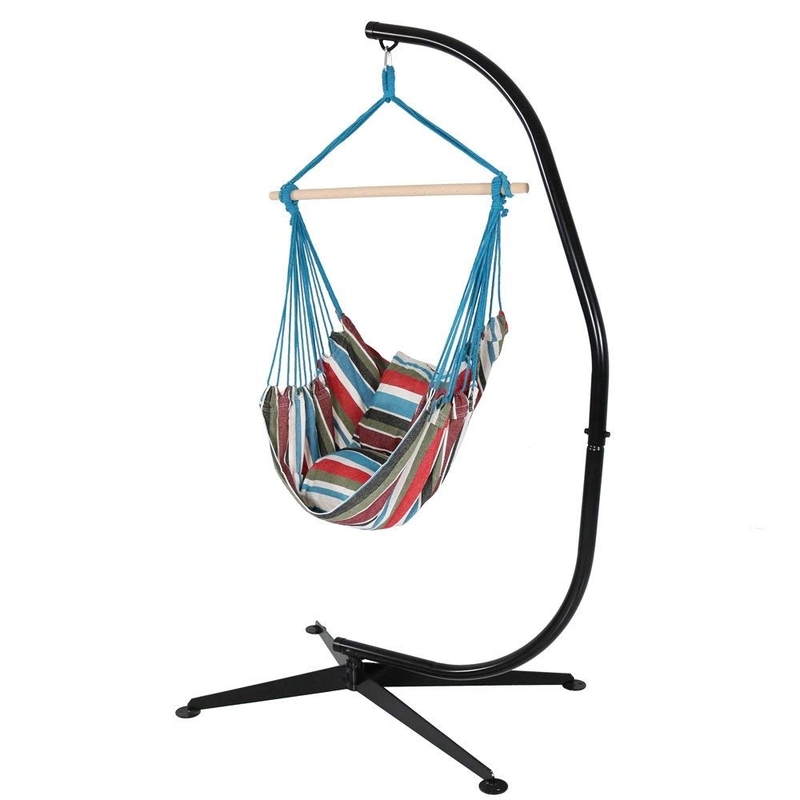 If you love hammock chairs, you will be glad to find this metal C-Stand available. It has a capacity of 300 pounds, a powder coat finish for durability and beauty, and is easy to assemble. Reasonably priced, you can easily set up two or more hammock chairs in order to share the experience of swinging in the breezes with family and friends. To use it with toddler equipment, some people have split pool noodles and placed them on the legs to protect the little ones from bumps. This “C” frame could almost be called an L frame. It is a little different from your standard C frame. Instead of the giant C on a three-legged base, it is shaped more like a marriage between a C and a slightly broken L. The base is a wide, three-sided rectangle whose ends turn upward, then narrow together to form the hanging apex at the top. A steel snap safety hook increases the hanging safety as it helps to prevent things from slipping off. Good for indoor or outdoor use, its capacity is 330 pounds. Selecting a hammock chair can be bewildering, there are so many styles from which to choose. You can narrow your choices by making some key choices. Who Will Sit in the Chair? If the occupant is a large adult, watch those weight limits for both seat and support. If you plan to use one of the C-stands for an infant swing, you might need to add some extra protection against tumbles as the leg braces are steel and could cause damage. If the chair will seat two or more people, plan for combined weight. Most of the hammock chair styles can be placed indoors or out, and many of these easy-to-place hammock chairs can fit inside a normal room, but a few require extra top space to be installed. Designs include simple sling, egg shapes, bowl shapes, and suspended tent. Two people seats are most often bowl shapes or suspended tents. Colors are varied, and most styles come in more than one color. Styles include basic sling hammocks with cushions, open weave slings perfect for summer, wide hammocks that are almost like a little-suspended tent and futuristic bowl chair styles. Cotton is a very comfortable fabric that feels good next to the skin and that “breathes.” It can, however, retain heat and moisture making it a less appreciated fiber for summer use. Open weave choices can be cotton or synthetic. The advantage of open weave is that it allows good air flow, but it can be harsh against skin and might require some sort of liner. Basic, one-person, hammock chairs are relatively inexpensive, and so are the stands. But you will need to watch those weight requirements. It’s false economy to purchase a lightweight unit for someone who weighs more than 200 pounds. Some of the hammocks come with their own stands, but some of them must be purchased separately. For your convenience, two styles of C-stand are listed after the descriptions of the hammocks. For some types of hammock, a third style large tripod might be necessary. The tripods or wooden arch styles of support are more robust than the C-stands. However, the latter are sufficient for most hammock chair types and have the happy advantage of being easier to move about. Protect your investment with a good cover, especially if it is intended for outdoor use. Wind, precipitation, heat and cold all affect your chair hammock. Even dust can have an effect. By covering it when not in use, you help your hammock chair to last longer. You can incorporate a hammock chair into almost any décor, even Victorian or Edwardian. All it takes is considering the colors in your room, the style of the chair, and the accessories. Adding a fringed shawl, some bright throw pillows, or decorative tassels can change the most basic hammock chairs into a luxury retreat. The best thing about a hammock chair is that every style is focused on comfort. Whether it is the simple sling or the elaborate pumpkin seat for two, hammock chairs are meant for relaxing, snuggling or even cuddling.